In a small city nestled deep within the heart of the rugged Swiss Alps, relaxing beauty and high-octane adrenaline come to live in perfect harmony. The traditional Swiss village, which sits between Lake Thun and Lake Brienz, offers inspiring scenery, mountain walks and action-packed adventures. A day at an Alpine Spa can easily collide with skydiving, snowboarding and night sledding in Europe’s winter wonderland. Interlaken has long been a key destination for winter sport in Switzerland and boasts one of the most picturesque landscapes in the world. With over 45 mountain railways, cable cars, chair lifts and ski lifts, the area is becoming increasingly famous for winter activity. Among the countless locations easily reached is Jungfrau, one of the top ski regions in the Alps containing four main peaks and more than 100 miles of ski trails all linked to Interlaken by mountain railway. The average length of the runs is about 4 to 9 miles, and various ski passes and packages are available. 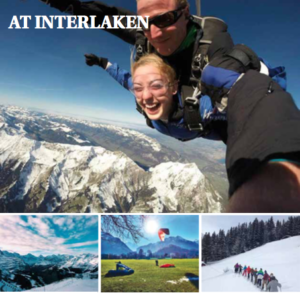 Additionally, the Interlaken area offers over 220 kilometers of cross-country and toboggan terrain. While skiing is one of the main attractions, a multitude of other activities make Interlaken an ideal retreat. Skydiving over the Alps from 13,000 feet up, snowboarding through the open terrain or skiing at any level of experience are all available during the winter season as well as paragliding, night sledding ice skating and canyon jumping. Snowshoe trekking and fun car, scooter and mountain bike rentals also offer an alternative way to explore the area adventurously. To counteract the energetic Swiss sport, Victoria Jungfrau Spa provides treatments ranging from simple massages to full-day wellness, a wonderful place to stretch out muscles after a day on the mountain. Interlaken also offers evening and night time entertainment, such as the daily chocolate show and casino, to finish off a full day of exciting activities. The show, beginning at 5 and 6 p.m., reveals how Schuh makes their world-famous chocolate sculptures. Casino Kursaal’s table games open at night for a lively way to end a long day. 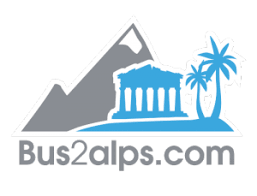 Traveling with Bus2Alps to Interlaken means that you will receive a 5% discount on almost all adventure activities with the company Outdoor Interlaken. They also arrange an optional day trip to Zurich, the shopping capital and largest city of Switzerland. With an open itinerary, visitors can cater the trip to their own interests, choosing their preferred activities while enjoying the comfort of planned travel and accommodations.